Today we decided to run offshore and net a bunch of pilchards for bait and then go look for some Snook. After loading up the baitwell we headed way down south to Harney River to fish the falling tide. When we arrived at the first spot we scored with 5 nice Snook to 12 lbs. At the next spot we caught a mix of Snook and Redfish. As the day went on the fish continued to bite and keep us busy. 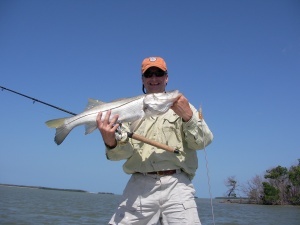 This day of fishing in the Everglades was full of fast action.